Thanks for all the up lifting words on my last post about my bum hip. It is doing much better. No pain at all yesterday. I did an intense 60 minutes on the elliptical, and continued to ice and stretch through out the day. This morning I was almost giddy with excitement to try running. The 5 year is out of school of Fridays, so I had to do a treadmill run at the YMCA. (hence the witnessing of the Walkman hilarium [is that a word]) I was hoping for 3 pain free miles, and I got 4... YAY me!!! I kind of pushed the speed, but it's hard not to play with the buttons while on the dreaded mill. I finished my YMCA time with 25 minutes on the elliptical. I love to sweat. There is something so rewarding about all that stinky sweat I seem to fling across the cardio room. I dread running on the mill, but I sweat buckets, and feel so cleansed after a run on the mill, followed by some elliptical time. Tomorrow is an easy 10 miler, which I will run with my hubby. Land Between the Lakes is next Saturday, and I am anxious to see how the hubby does with his first race EVER. It will also be my 14Th marathon, and 2 weeks before my 50 miler. Three Cheers for some fun running ahead. **Don't forget to check out this sweet compression sock giveaway HERE. I once saw a guy in the Paris Y with a discman. You look at those things wrong and they would skip. My grandparents still have a coffee pot from 20 years ago. They swear by it! I'm glad your run went well today! Bet the rest of your day'll be pretty fantastic! Wait a minute. I might have one an old Walkman at my house...and tape to go with it. heehee. Haha, that would have been hilarious to see!! And YAY on no hip pain! Phew!! A walkman, WOW. That's all kinds of awesome. I guess it's better than a discman, since it won't skip. ha! 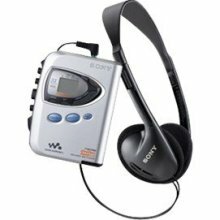 I have one of the new Walkmans (mp3 players) but I giggle anytime I tell someone its name because thats EXACTLY what I think of. Aw, I love that little old man. I can't even imagine running 50 miles - way to go!! I am doing Tall Mom's 1000 mile challenge and decided to see if there was anyone else from KY. That is awesome about the 50 mile run Good luck! That Walkman story is so, so funny. I remember those days. Ugh. You've only got one cassette tape so you better choose those 60 minutes wisely when preparing the mix tape! Can't wait to see you at Buffalo! Yay for no hip pain!! Hey Janice. I saw your blog on your brother Glen's FB. We went to high school together, but I was younger than you and played lots of volleyball with Glen. Anyway, I think your blog is awesome. I'm running the SLC marathon too. My first one. Hopefully, I'll get to see you there. That's great that you're running a 50 miler. Good luck with that!